Nestle’s Kasambahay Habambuhay ~ Philippine Freebies, Promos, Contests and MORE! Through the years, Nestle' has become part of every Filipino family's way of life. 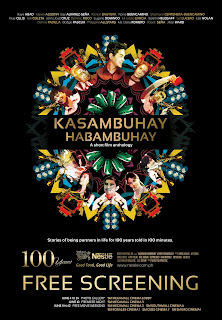 In celebration of their 100 years of good food and good life, they bring you Kasambahay Habambuhay. A 100-minute anthology of 10 short, entertaining and creative films directed by a select roster of commercial directors who have wheeled Nestle' TV ads. With efforts of tossing different types of narratives from various Nestle' products, still, there could only be one story for each brand. Films will be premiered on June 10 at SM Megamall. There will be a FREE screenings on June 11 and 12 at selected SM cinemas nationwide (Megamall Cinema 3, Southmall Cinema 6, Rosales Cinema 1, Davao Cinema 1, and Cebu Cinema 7). Screening will start at 11AM. Five (5) lucky viewers (1 per cinema) will get to win P10,000 per area just by voting their favorite short movie or story at the end of the film showing.